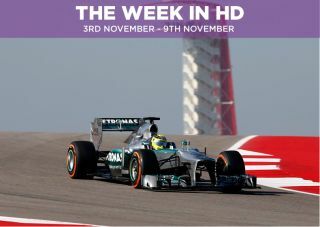 The Week in HD - Monday 3rd November | What Hi-Fi? Also, don't forget to check out our dedicated Playlist Twitter account @WHFPlaylist for the all latest news and reviews of our favourite music, movies, TV shows and games, as well as competitions you can enter for some shiny prizes. The fourth series of Sherlock is still a while away, although there will be a TV special early in the New Year. So, if you're after your fix of Benedict Cumberbatch as the sleuth detective and Martin Freeman as his always dependable friend Dr Watson, this release will hopefully tide you over. The end is in sight for this austere and glamorous series. Some have labelled Mad Men as boring, but we find it to be a series that's elegant and takes its time. The seventh series is split in two, with the first seven episodes included here and the rest set to air in mid-2015. Jon Favreau returns to smaller, independent films with Chef, where he plays a chef (duh) fired from his job after a disagreement with the owner (played by Dustin Hoffman). He sets off to rediscover his zest for life and cooking by buying a small food truck, all the while developing a bond with his son. The story is a bit sappy, but if you love food, then you'll salivate over the dishes that Favreau's camera covers. The film also boasts a top-notch cast, including Robert Downey Jr., Scarlett Johansson, Sofia Vergara and John Leguizamo. Just when you thought it couldn't get any longer, Peter Jackson adds another twenty-five minutes to the Desolation of Smaug. Fear not though, even with a chunkier running time this sequel improves on An Unexpected Journey with a bit more in the way of thrills and focus. Still, the lack of a conclusive ending stings (again) and it can't get over the feeling that this is a smaller-scale story that's been expanded a mite too much. Do we recommend you watch this film? Not with good conscience, no. But for those who want to journey back into time to see the late, great Bob Hoskins as the moustachioed plumber and Dennis Hopper as King Koopa in this odd, misguided and laugh-out-loud bad adaptation of the massive Nintendo franchise, well, now you can watch in all its high-def glory. The Long Honeymoon. The sixth series of the veteran sitcom kicks off with Cam and Mitchell returning home after getting married. Modern Family has been a little inconsistent of late, but this season could be a return to form. Arkham. Detectives Gordon and Bullock go on the hunt for a hitman hired to influence the council's decision as to who should develop on the old Arkham Asylum site. Slabtown. We don't like the sound of a place called Slabtown, and when that place exists in Walking Dead, it has to be a bad thing. In Slabtown we get to meet another group of survivors, but are they what they seem? Eldorado. It's the series finale of the fantastic Boardwalk Empire, which can only mean more grief for everyone involved. In this episode, Nucky attempts to relocate from Atlantic City to Manhattan. Will he be able to do it? Losing against Real Madrid was a blow, but Liverpool still have a chance to qualify for the knockout rounds of the Champions League. However, losing at the Bernabeu will make that objective much harder, and - as of late - Real have not been in a forgiving mood. Fastest Man Alive. The Flash surprised us with a decent opening episode last week. While it featured some clichéd storytelling and felt a little rushed in places, it had no small amount of charm and ended on an interesting note. Barry Allen (Flash to you and me) faces more difficulties this week when he confronts a robber who can make multiple versions of himself. What is our Future? The final episode of Prof. Brian Cox's look at the universe. This episode has a look at what lies ahead for humankind. This could make for a good double-bill when Christopher Nolan's similarly themed Interstellar takes off on Friday. The Chelsea juggernaut keeps on rolling with an air of inevitability. Will Maribor be able to halt them? Not if they offer the sort of resistance they did in the previous match (i.e. not much). Cairo. Kevin fears he losing touch with reality after a confrontation with the leader of the Guilty Remnant movement while Jill, still looking for a way to make sense of what happened, joins the Remnant. The venerable film reviewing series is back (for seven episodes) as Claudia Winkelman and Danny Leigh look at the week's new releases - including Christopher Nolan's Interstellar and rom-com Say When. Where's the Dignity? There's a hint of secrecy and desperation in this week's episode of The Knick as Algernon makes a bid to get on the surgical team and Lucy snoops around Thackery's private life. Sara. After one of their own was killed, Oliver and his super-powered friends draw up a list of possible suspects before a new threat appears on the scene. It's a week of finales, with the second series of Peaky Blinders also coming to an end. Tommy faces some difficult decisions as he plots revenge against his enemies while attempting to take his business to the next level. Making Friends and Influencing People. We finally find out where Jemma has been – she's working at Hydra! More familiar faces return when Donnie Gill (Dylan Minnette, who last appeared in an episode titled Seeds) is wanted by Hydra for his freezing abilities. Liblabble. As we skate through the letter L, Fry and his guests - including Reverend Richard Coles, Sara Pascoe, Bill Bailey and Alan Davies - have a look at a list of L-themed larks that have been granted the moniker of Liblabble. Doesn't it just roll of the tongue? Big, big match at Anfield as league pacesetters Chelsea come up against a struggling Liverpool team. Mourinho's men played a key part in ending their opponents' title challenge last season; could they do it again with only eleven games gone? The World Cup is a year away and preparation for the tournament starts now as Scotland take on Argentina at Murrayfield. Death in Heaven. All things come to an end as the first series of Peter Capaldi's stint as the Doctor reaches the finishing line. There will be panic on the streets of London with the Cybermen running amok, and the Doctor reuniting with old friends to combat a familiar threat. The circus of F1 reaches Brazil with the destination of the championship still unknown as Rosberg and Hamilton go toe-to-toe at the Autodromo circuit. Neither one will be able to win the championship at this race, but a win for Hamilton would almost secure it, while a good result for Rosberg will give him a fighting chance for the season-ending race at Abu Dhabi. The final match of the International NFL series features the Dallas Cowboys going up against the Jacksonville Jaguars. After the last-gasp heroics of the previous match, we're hoping this encounter matches the excitement of what's been a popular series of matches. About a Boy. Homeland is fighting on three fronts this week as Carrie tries to reassure a frightened asset, the beleaguered Saul spots a familiar face and Quinn and Fara go on a stakeout.